NEW YORK -- U.S. manufacturing grew at its quickest pace in four months last month as output and new orders increased and firms took on more workers, an industry report showed Thursday. 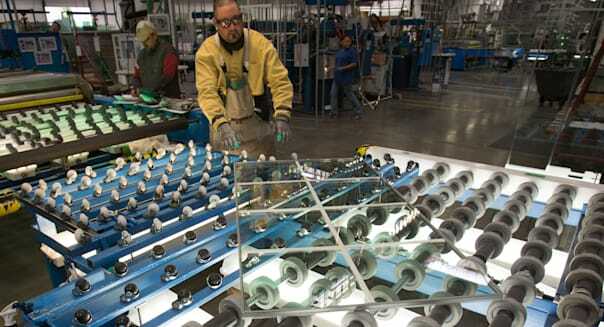 Financial data firm Markit Economics said its final U.S. Manufacturing Purchasing Managers Index for July rose to 53.7, the highest since March. That beat both a preliminary July estimate of 53.2 and June's 51.9 reading. A reading above 50 indicates expansion. Output also hit a four-month high, rising to 54.8 from 53.5 in June, and new orders from domestic and overseas clients rose. That helped support a modest rebound in hiring, with the survey's employment sub-index rising to 53.0 after slipping to 49.9 in June, its weakest in three and a half years. "Nevertheless, the rate of manufacturing growth remains weaker than at the start of the year," said Markit chief economist Chris Williamson. "In particular, employment is generally rising at a disappointingly weak pace." He added that the rise in new export orders may reflect pay back from declines seen over the prior two months. That could give the Federal Reserve pause when it considers how soon to start winding down its massive stimulus program. The central bank's policy-setting committee gave no hints Wednesday of an imminent pull-back in bond purchases and said low inflation was a concern. Government data Wednesday showed the U.S. economy grew at a 1.7 percent rate in the second quarter, comfortably beating the 1 percent pace forecast in a recent Reuters poll. Most economists expect growth to accelerate in the second half.